Cymbalmagic offer the highest quality, most comprehensive cymbal repair and modification service on the planet. Cracked cymbals can be restored in a way that has minimal effect on their original sonic quality; whole new sound palettes can be created. Differentiate your kit with unique cymbal designs that stand out visually as well as sonically, and create new EFX cymbals from those gathering dust in your case. Thousands of UK drummers have benefited from our services. 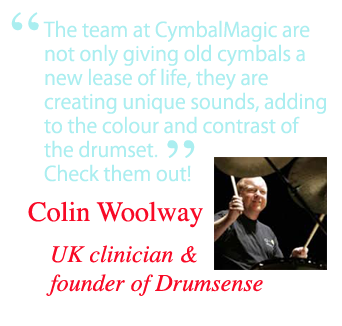 We're very proud to include top UK drummers, clinicians and teachers in our artist roster, including Colin Woolway, Rich Kass, Dave Mckeague and Harry Pope. All repairs are guaranteed for 6 months. We are entirely confident of the quality of our work, if a cymbal cracks at the site of a repair within the 6 month period, we will re-repair free of charge and cover return postage and packing costs. If re-repair is not possible, we will either create a bell or splash from your cymbal FOC, model dependant.